Days 3 and 4 of our Bali experience were even more amazing. We spent Monday on sightseeing, sightseeing, and more sightseeing! There is truly so much to see in Bali, and we got to see a lot of it on this day. Matt and I ended up scheduling a day trip with a driver who we had tried to hire the first day of our trip (the Hindu holiday) with no success. His name was Gusti, and he turned out to be an awesome driver that we used for 3 different days of the trip. I had heard of hiring "private drivers" while planning the trip, but I pictured something like a taxi driver that would just drop us off places and wait for us to return to the car. In Bali, however, a driver is much more like renting a tour guide for the day. Gusti had a really nice car with great air conditioning and a cooler in the back full of cold soda and water. He didn't just drive us to places - he went out of his way to take us through scenic areas, all the while telling us about Bali and answering any and every random question we had for him! He also went with us into every temple and place we wanted to go, acting as an unofficial tour guide. He explained all about the different religions in Bali, the government, the terrorism in Indonesia, the caste system that still exists today, and we even got to learn about his own family and about his son that would be following in his footsteps as he attempts to grow the family driving business. Through Gusti, Matt and I were able to learn more about Bali than any other place we've traveled to before. One of the first stops of the day - and one of the most spectacular things I've ever seen - the enormous rice terraces of Jatiluwih! There are rice terraces all over Bali - smaller ones even while you're driving through the towns - and they all have these amazing staircase-like terraces in all different organic shapes where the rice grows. Rice needs an incredible amount of water to grow, and these steps are a way of keeping that water retained for the rice to thrive. One great thing about Jatiluwih was that it was a little far to get to, which meant there were hardly any tourists there. In fact, there weren't very many people there at all - Gusti explained to us that the workers that harvest the rice work only in the mornings and evenings as mid-day is way too hot in the sun for them. We literally went "off the beaten path" as we walked across the ledges to get right in the middle of the terraces! Another note-worthy stop of the day - Pura Ulun Danu Bratan - one of the most famous temples in Bali. The tall pagoda is sitting on a pretty lake with moutains in the backdrop. In fact, it is one of the symbols of Bali, and it is also on the Indonesian currency (Rupiah). The one side of Tanah Lot was a black sand beach - so cool! Tanah Lot at low tide - at high tide, you cannot walk up to the temple on land! Probably THE most popular place in Bali to watch a sunset, Tanah Lot did not disapoint! Our first and third dive sites - Crystal Bay. This is where the Mola Mola were supposed to hang out, which is why we dove it twice - in hopes of spotting them. They weren't joking about the currents here, though - they were super strong! 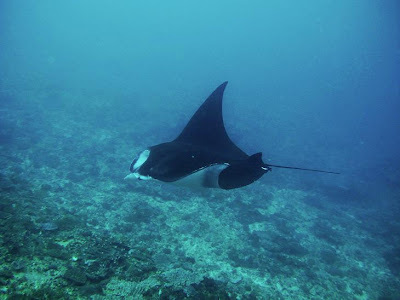 Our second, coldest, and best dive of the day - Manta Point - where we saw (you can guess...) Manta Rays! Tuesday night - we ate at one of our favorite restaurants of the trip - Ku De Ta. The actual restaurant portion is super fancy, but it also has the most amazing outdoor lounge/restaurant area that is slightly more casual and trendy! It was AWESOME! Basically, the scene is a bunch of reclining sofa/lounge chairs with umbrellas and candles that are right on the beach. Live music is playing, and you can order drinks, food, even cigars to enjoy on your lounge (we did all three!) So relaxing! One more part of our Bali-extravaganza coming soon - stay tuned! !